Take the B827 road between Comrie and Braco. 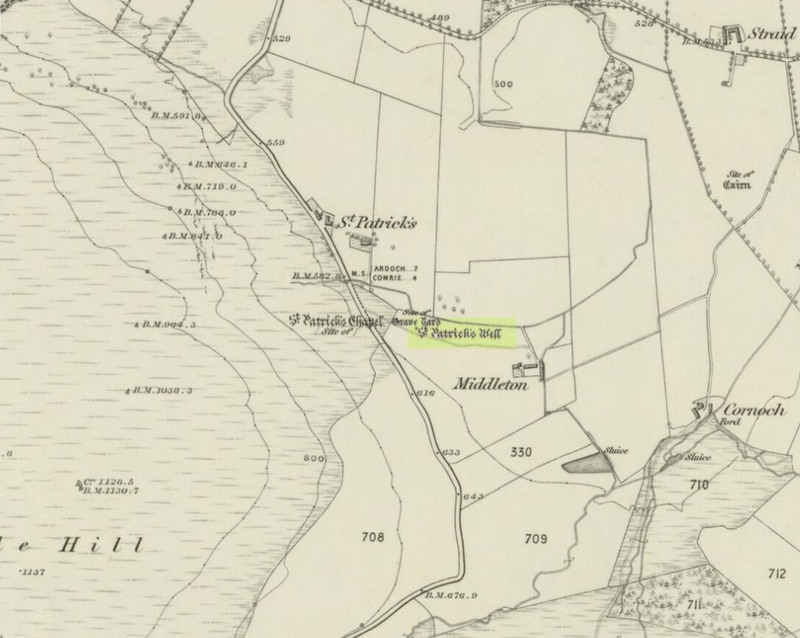 If you’re coming via Comrie, going uphill for 3.1 miles (5.1km); but if from Braco Roman Camp go along and eventually downhill for 6.6 miles (10.6km), watching out for the track to Middleton Farm by the roadside. Walk along for 125 yards, keeping your eyes peeled for the boggy ground below on your left. You’re there! 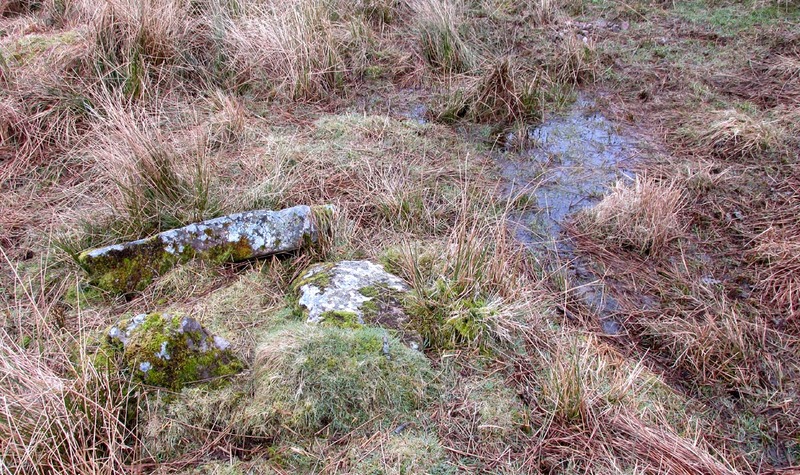 Immediately east of the prodigious megalithic complex at Dunruchan, bubbling up amidst the usual Juncus conglomeratus reeds, are the boggy remnants of St. Patrick’s Well—one of two such sacred wells dedicated to the early Irish saint in Muthill parish. We’re at a loss as to why this Irish dood has such sites in his name in this area. No doubt some transitional shamanic character was doing the rounds in this glorious landscape, muttering words of some neo-christian animism, eventually settling a mile from the great megalithic complex, perhaps hoping—and failing—to convert our healthy heathen populace into ways unwise. Whatever he may have been up to, a small stone chapel was built hereby and, it was said, even a christian graveyard, to tempt folk away from the ancient plain of cairns whence our ancestors had long since buried their dead. But the christian’s chapel and graveyard has long gone; and when historians before me had visited the place, St Patrick’s Well had also fallen back to Earth in the drier summers, taking the blood of the Earth back into Her body. The heathen megaliths still remain however, standing proud on the moorland plain in clear sight from these once healing waters, whose mythic history, on the whole, has long since been disregarded…. Also in Muthill parish, Guthrie told, St Patrick’s memory was held in such veneration that farmers and millers did not work on his day. Banks, M. MacLeod, British Calendar Customs: Scotland – volume 2, Folk-lore Society: Glasgow 1939. Booth, C. Gordon, “St Patrick’s Well (Muthill Parish),” in Discovery & Excavation, Scotland, New Series volume 1, 2000. Guthrie, E.J., Old Scottish Customs, Thomas D. Morison: Glasgow 1885. 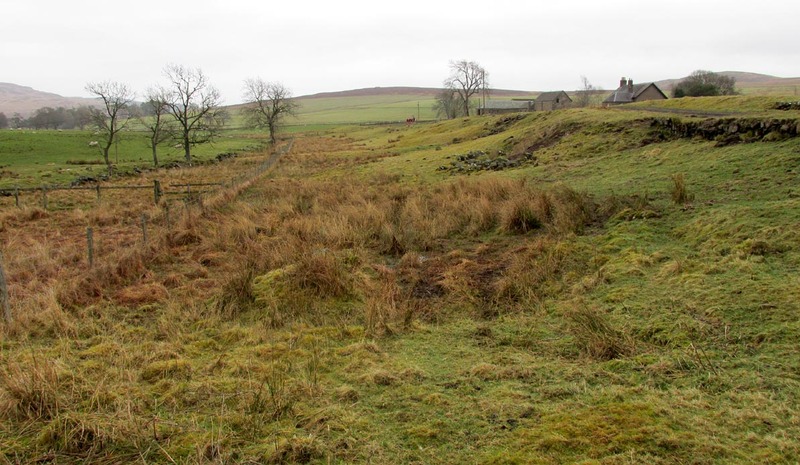 This entry was posted in Holy Wells, Perthshire, Scotland and tagged animism, antiquarian, antiquities, Archaeology, Comrie, customs, Dunruchan, folklore, Glen Artney, heritage, Holy Wells, medieval history, Muthill, Perthshire, sacred sites, saints, Scotland, St. Patrick, traditions, water. Bookmark the permalink.